Just like the 30’s are the new 20’s, former professional wrestlers appear to be the new MMA superstars. Following Brock Lesnar’s spectacular victory over Shane Carwin at UFC 116, Strikeforce CEO Scott Coker seems a lot more interested in showcasing another WWE stud. Although the 41-year-old has no REAL combat experience under his belt, Coker is impressed that Batista has hired a striking coach and a ground instructor to hone his skills. He’d just prefer to window shop some more before making a purchase. Batista’s star power and ability to attract a slightly different demographic are clear selling points for the overly-chiseled heavyweight. 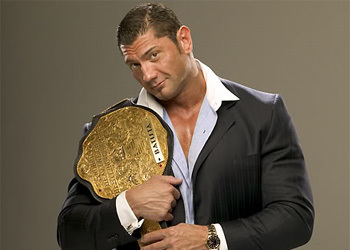 Although the charismatic promoter isn’t too anxious to acquire Batista’s services, he does believe there might be something there. “We’re not the guys that are putting all the circus fights on,but in all fairness, look at Brock Lesnar. He made the crossover. Why not Batista?” Coker wondered out loud. If Strikeforce inked Batista, they would have access to another former pro wrestler to go alongside Bobby Lashley. There’s no way you could resist arranging a REAL scrap between the former FAKE fighters, could you Scotty? “That would just be a fun fight to watch,” Coker added.